Juan Lopez from the Breaking The Bank blog (don't look, he hasn't posted in 8 months. Just too busy) arrived at La Casa Kautz at 7:15 so we could meet Yuki in San Andreas (yes, like the earthquake fault) at 8:00. 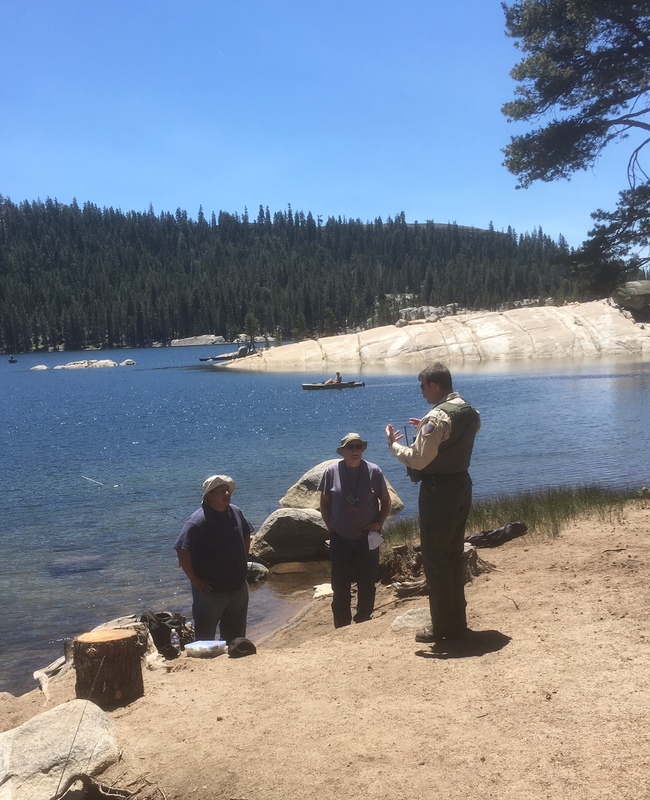 Our plan was to fish Hobart Creek that feeds Spicer Meadows Reservoir because it opened today. We got coffee at Starbucks in Angels Camp, got Yuki into the truck and headed to the creek. It took us a good hour and a half and being the Friday before the 4th of July weekend we expected crowds. When we got to the parking lot, it was all but empty. No one was fishing Hobart Creek. We found out why they wait until July 1st to open it for fishing. There wasn't any water in it. Plan B was to fish Spicer at the dam where I caught that one back on June 21st. Catching didn't pan out so we decided to run up the highway a couple miles to Lake Alpine and give it a try. Our guess was that it probably had a lot of people there, but we found a small spot where we could get a couple lines in the water. In the photo below this young man was going to see if there were any fish in the lake. Reminds me of myself at that age. He went through a lot of trouble putting on fins and a mask with snorkel for a look around just about where he's standing and then got out. My guess was the water was too cold. I didn't talk to him after he got out, it was one minute he was floating around and gone the next. Don't even know if he saw any fish. We didn't see any. While we were sitting, waiting for the first bite, I took a couple shots around the lake. I know you've already seen the lake before, but look anyway. While Juan and I were sitting and talking I noticed Yuki fiddling with his fishing license. Then this guy showed up. In case you've never seen one before, this is what a Game Warden looks like. License check time. First time for me in a gazillion years. Yuki license, check. Me, license check, Juan looking for his. Hold on, Juan is still looking. He's emptying his backpack. Ooops, no license. "Follow me" said the Warden. We thought it was a good omen that Juan wasn't in handcuffs. He was gone a really long time though. We figured that since he didn't have his fishing license and was probably off to jail, continuing to fish would be like rubbing salt into a wound. We packed up with the hopes he would return by dinner time and we could all go home. He did return about a half hour later. In the mean time a group of teenagers moved in where we were and started swimming, splashing, and being their general rude selves, so it was a good thing we decided to leave. I was worried what Juan would tell his wife about the $500, $600, or so fine for fishing without a license. Oh, he had one, just must have left it home. As it turned out, the Warden was able to call someone, check that Juan really did have a license, slapped his hand and sent him on his way. Some People Are Just Damn Lucky. Yuki and I are going to try to get to White Pines Lake as soon as it cools off some. It was only supposed to be 91 degrees today. It was 101 when we got back to the house. Just too hot to sit on a lake. I went fishing 2 years ago and had a great day until I realized I hadn't bought my license yet. I still have nightmares about that. Actually, I would prefer to see more Wardens in the field checking folks. I have not been asked in years to produce a license.............. What good are regulations if the regulated waters are not monitored? Sounds like an issue I had one time. Turned out OK...wardens do understand. Yeah I have literally never been stopped by a warden and asked o produce a license, even though I see them and stop to chat with them as often as I can! We had to display ours in the past, but they changed that a few years ago. I still wear mine on a lanyard along with clippers, hemostats, and a safety whistle.